ISIS has emerged from the wounds of the Arab world—for which the west is to a large extent responsible—and current airstrikes are pouring salt into these wounds. Demotix/Konstantinos Tsakalidis. All rights reserved.After the terror attacks in Paris, which killed at least 129 people, President Hollande vowed to destroy ISIS. This was followed by a night of intensive air raids on the city of Raqqa, the capital of the so-called Islamic state, where activists reported that abandoned ISIS bases and buildings were targeted. France’s response is a typical example of western knee-jerk ineffectiveness to the challenge of ISIS, which was driven by the desire to show strength and to assuage domestic fears. There seems to be little understanding that the rise of ISIS is directly linked to the accumulation of grievances in the Arab world, in which the west has played a significant role. One only needs to note that the current strength of ISIS is estimated by some experts to be around 40,000 - 50,000 fighters, which is even greater than the 30,000 estimate made by the CIA when the airstrikes began, even though the “international coalition” has claimed it killed thousands of fighters. This indicates that either the intelligence was inaccurate or that ISIS' recruitment has been increasing exponentially. Even though ISIS has been subjected to international airstrikes, they have been able to capture more towns in both Iraq and Syria, such as Ramadi and Palmyra. Although they lost Tikrit and more recently Sinjar, their hold on their territory is firm, and growing. The west is completely ignoring the nature of Syrian and Iraqi polities and that the rise of ISIS cannot be remedied with military force. In Iraq, the rise of ISIS and the inability of the Iraqi state to tackle this challenge stems from the sectarian nature of the political system and, most importantly, the sectarian nature of the security apparatus. The collapse of the Iraqi military—which the US invested heavily in rebuilding—in Mosul then Ramadi has caused the central government to rely on openly sectarian Shi'a militia. These militias, the only force in Iraq currently capable of confronting ISIS on the ground, have committed documented atrocities against the Sunni community, most recently in Tikrit. Thus, building a cross-sectarian alliance with the Sunni community has become almost impossible, as many Sunnis view ISIS as the lesser of two evils. In addition, reliance on these militias is making the position of the central government even weaker, even opening up the possibility for the partition of the country post-ISIS, a concern expressed by the American ex-Chief of Staff, General Dempsey. The roots of the rise of ISIS can be traced back to the post-invasion sectarian political settlement imposed by the US, and described by Toby Dodge, in his book Iraq: from war to a new authoritarianism, as an exclusive settlement. It excluded the old elites from power and pushed them towards armed rebellion. This was followed by an openly sectarian policy by the Iraqi government under El-Maliki’s leadership, further alienating the Sunni community and elites. This included the exclusion of the Awakening Councils (Sunni militias) who had collaborated with the Iraqi government and American forces against Al-Qaeda in Iraq, the parent organisation which gave birth to ISIS. This was followed by outright persecution of the Sunni political elites. Western powers are failing to understand that autocracy is one of the main drivers to radicalisation. Interestingly enough, even though Prime Minister Abadi has promised to mend relations with the Sunni community, very little has been achieved due to the general weakness of his position in relation to the militia and their ability to veto any real reconciliation with the Sunni elites. Thus, the rise of ISIS benefits the sectarian Shi'a militia who have no desire for inter-communal dialogue, and the central government is unable to follow a different policy. On the other hand, in Syria, state collapse in large parts of the country and the fragmentation of the rebel forces have allowed ISIS to expand dramatically capturing large swathes of territory and valuable gas and oil resources, which it now uses to finance its operations. The involvement of Russia has not only complicated matters in terms of international diplomacy, it has also given ISIS a boost on the ground. ISIS, for example, has made gains in Aleppo province and is the closest it has been to the city of Aleppo. This is also compounded by additional gains in the central province of Homs, which was previously a concentration of primarily non-ISIS rebel groups. This has weakened non-ISIS rebels, giving ISIS more room to manoeuvre and gain more territory. This is also compounded with the fragmentation of moderate opposition and the decimation of their ranks due to desertion, exemplified by the Free Syrian Army for example. This can be attributed to problems of funding, where fighters move to other factions that are better funded and have better weaponry. As such, moderate opposition is being decimated by a combination of Russian airstrikes, poor funding, and fighting a long war of attrition against Assad who has been trying to offer himself as the only available alternative to ISIS. Western goals seem to be more focused on fighting ISIS than Assad, which is not aligned with the priorities of actors on the ground. The US, for example, is attempting to create a rebel force that will be exclusively focused on fighting ISIS and not Assad through the “Train and Equip” program. The first group to enter Syria was quickly ambushed and destroyed, with some intelligence suggesting that the Al-Nusra Front—Al-Qaeda’s affiliate in Syria—seized their weapons. This lack of alignment makes alliance with the west more tenuous and difficult to maintain, since Assad not ISIS is seen as the main threat by most rebel groups—with good justification since most civilian deaths have been caused by Assad’s forces, not ISIS. Thus, as in Iraq, as well as in Syria, the local forces engaged in the fight against ISIS are not considered reliable allies by the west, making the mission of destroying ISIS much more complicated. On the other hand, the west’s policy of supporting autocracy, under the rubric of stability and fighting terrorism, continues unabated. The clearest example is Egypt, which has an active insurgency in the Sinai that recently claimed the bombing of a commercial airliner that killed all 224 passengers on board. The insurgent group responsible, Walayat Sina, has pledged allegiance to ISIS. The Egyptian military regime, which has been accused of a large number of human rights abuses including the largest massacre of protestors in modern Egyptian history, has received ample amounts of political and military support from the west. El-Sisi, the current president, has been welcomed in major European capitals and has received ample amounts of western arms, including French fighter jets. This shows that western powers are failing to understand that autocracy is one of the main drivers to radicalisation and that supporting autocracy will only complicate rather than resolve the problem. For example, under the guise of border security and fighting terrorism, the Egyptian military has demolished people’s homes on the border with Gaza, a clear violation of human rights. This will fuel rather than counter radicalisation, making Walayat Sina even more attractive. In the end, one could argue that the nature of the west’s response is inept and too narrowly focused. 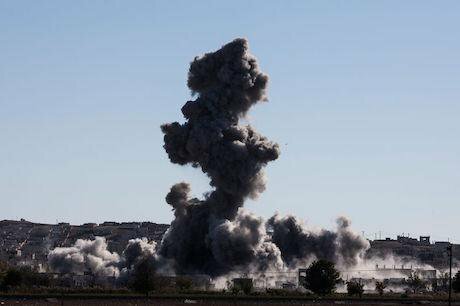 The use of airstrikes has not only proved ineffective, but also arguably counterproductive. Western policy is hampered by the lack of reliable allies on the ground, which is partly the result of policies followed in Iraq after the invasion, and partly the lack of strategic alignment with rebel groups in Syria regarding the importance of fighting Assad. This, combined with a policy of supporting autocrats, is aggravating the problem of radicalisation to say the least. The west does not seem to understand that ISIS has emerged from the wounds of the Arab world—which the west is to a large extent responsible for—and current airstrikes are pouring salt into these wounds.